Titan Wildcat Hard Tail Mountain Bike is a stylish and sleek machine built with care and utilized for both urban movement and exercising to keep fit. It comes with a twelve speed gearing system and a very easy to use shifter that is operated with the thumb so you can select whatever gear you want based on the nature of the terrain. This bike is designed with junior girls in mind and offers a fifteen inches frame fabricated from steel, twenty six inches tires offering an smooth and balanced riding control, adjustable seats made of vinyl, handle bars that comes adjustable, front brakes utilizing the linear-pull technology, heel operated rear brakes, and can support weights up to two hundred and fifty pounds. It is available in many beautiful colors. Sturdy frame manufactured from a high quality steel material and measures fifteen inches offering superb and durable support. A massive alloy wheel sized at twenty six inches and comes with hubs made from steel. Employs a twelve speed gearing configuration for variety of speed choices based on type of terrain. Comes with effective brakes for the rear and front tire thus ensuring a more controlled and efficient stopping force. Seat can be adjusted to accommodate varying heights. The Titan Wildcat Hard Tail Mountain Bike is a petite bike designed for junior girls and rides on feminine instincts. It comes partially assembled so before you can unleash the potentials in this bike, you have to take it to a bike shop to get it properly tuned as the assembly is a bit complicated plus the bundled instructions did not help. The bike is solid, at least for a lady, and offers decent features that will survive the rigours of urban movement and biking around the neighbourhood. This bike will not take the heat of trail or hard-core biking. If you are looking for an exercise bike, this perfectly fits the bill. The seat is very comfortable and can be adjusted to accommodate people who are not all that tall. The twelve speed configuration is adequate considering this bike is limited to decent usage but the wheels are massive and rides well with sufficient grip. 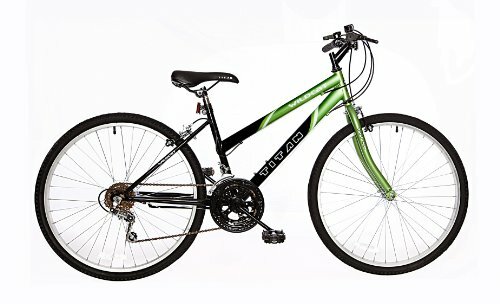 Generally, if you are not into mountain biking and need a runabout bicycle, this is the best choice out there.